Another day has gone past and we've still to announce the signing of a new player or even a player we've currently got in our squad on a new "long term" contract. Hopefully today will be better. We all know Arsene Wenger and Ivan Gazidis have been busy trying to conclude deals. 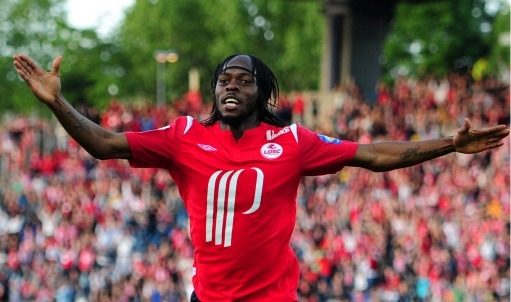 All appears to be going well with the move to sign Gervinho. France Football reported yesterday that the Ivorian would meet with the club officials to discuss his move to north London, so hopefully the negotiations will go without a hitch and we should see his signing announced on the official site before the week is out. However The Times report Lille want £14m for the player who is out of contract next summer with Arsenal only willing to offer £10.6m. You would hope a deal can be reached sooner rather than later. With Blackburn having received an offer from the club for Christopher Samba, you would have to think we'll move our attention to the centre of defence once Gervinho dots the i's and crosses the t's on his contract. It will interesting to see whether we go back to Blackburn with an improved offer or whether we'll turn our attention to another player. Another area where I believe we need to strengthen is in defensive midfield. But there has yet to be any noise coming out of the club, speculation in the media or agent talk about us being linked with anyone who plays in this position. I know the likelihood of Alex Song's participation in the African Cup of Nations is minimal - Cameroon have to win their two remaining games and hope results go their way to qualify for January's tournament - but even still he won't be able to play all 60 games next season, his injury record this season has proved that. With Denilson likely to leave - if we can find a club willing to meet our valuation for him - we need a reliable replacement for Song. Someone who is either better than him and takes his spot in the team or a versatile player who will step into that role when he's not able to play. I'm led to believe we're not targeting anyone in this role because Arsene Wenger wants to see how Emmanuel Frimpong and Francis Coquelin do in pre-season. The young Frenchman won't have much time to impress though as he's off to the Under 20s World Cup. I do feel we need someone in that position and handing it to a youngster if Song is injured is a risk. But we all know what a success Jack Wilshere has been this season, so I don't mind giving them the benefit of the doubt. A striker is also on my list of must buys this summer. Depending on which story you believe, West Brom striker Peter Odemwingie is either a target for us according to the Daily Mail or he has already turned us down because we can't meet his wage demands according to the Daily Star. One thing's for certain, we won't break the piggy bank open for a 29-year-old with one season left on his current deal. You've got to ask yourself if an ambitious player who has the chance to play Champions League football would be quibbling over a few thousand pounds a week? And if Nicklas Bendtner is subject to a move to Borussia Dortmund like the Daily Express suggest, we'll have to replace the big Dane. The Times say of Bendtner's move that the German club aren't willing to match Arsenal's £12m valuation of the player. It looks as though Samir Nasri has made his mind up on his future. To see out the remaining year of his contract at Arsenal then go and sign a bumper pay deal next summer, according to France Football's Philippe Auclair. The journalist gave his thoughts on the subject to talkSPORT last night. I would be surprised if Arsene Wenger and especially the club allowed that to happen. If it was made clear to Nasri that he wouldn't be considered a starter in the first team in the season which leads up to Euro 2012, I think that might make him focus more clearly on what he wants for his future other than a big weekly wage. The player holds all the cards in this situation and you've got to question why the club didn't make him an ultimatum last summer when we were in a better negotiating position. A contact was certainly offered but he stalled and stalled and the club are now in the last chance saloon as to whether we can hold on to him for more than one more season. Personally I don't think Nasri's situation has anything to do with whether Cesc stays or goes or whether the club matches his ambition with the players we sign in the transfer window. It's down to how much money he gets each week. If Nasri has told us he's off next summer, now is the time to be buying his replacement so that there will be a seamless transition once he leaves. Extra reading comes in the form of an interesting post on Gael Clichy over at 7amKickOff. And finally, The Sun expect Jack Wilshere to be involved in another club vs. country row if the 19-year-old is selected for next year's London Olympics. I think we can wait a few months before deciding whether this will be an issue and my early thoughts are it won't be.